The dictionary definition of common sense is “sound practical judgment; normal native intelligence.” How, then, does common sense fit in to the Kingdom of God? The answer – it doesn’t. Just about everything that the world accepts as normal is abnormal for the Kingdom. 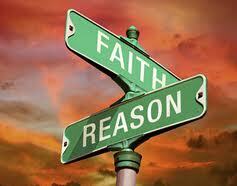 By its very definition common sense does not require that you exercise faith in God. But in order to walk in obedience to God's ways we must abandon much of what the majority would deem to be common sense – not in favor of abject foolishness, but rather in pursuit and apprehension of those things that lie beyond what common sense can afford us. Creation is groaning more and more loudly for the manifestation of the sons of God. We ourselves groan inwardly. We desire to be what we were originally created to be – the image of God on the earth. The reality is that God doesn’t use common sense. It is by Wisdom that He formed the earth, and it is by Wisdom that He governs the universe. The world’s definition of wisdom is “the ability to judge what is right; common sense; the sum of learning through the ages; knowledge.” Many, therefore, see wisdom as a kind of common sense - maybe just at a higher level. 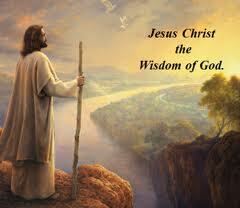 God’s Wisdom supersedes common sense as well as what the world calls “wisdom”. True Wisdom is supernatural intelligence. Wisdom is the ability to tap into the mind and heart of God, and to move in cadence with Him – to know beyond what your ‘common senses’ – sight, smell, touch, taste and hearing – tell you. In fact, sometimes Wisdom just does not make sense! The Wisdom of God is foolishness to men because it overrides the five natural senses and man’s intellectual capacity to reason rationally. Where is the wise? Where is the scribe? Where is the disputer of this age? Has not God made foolish the wisdom of this world? Wisdom advises that in order to save your life you first have to lose it. Wisdom teaches that the way to lead is to first follow, and that the way to greatness is through servanthood. Wisdom declares that you must love those who hate you. Wisdom admonishes you to have faith in God (have the faith of God) Whom you cannot see when you’re tempted to worry about the things you can. Wisdom sends you into a battle that’s already been waged, to fight a fight that has already been won, so you could experience the thrill of victory. Wisdom promised an elderly man that he would become the father of many nations. Wisdom waited until he and his wife were past child bearing age before delivering the promise.This man was Abraham. Wisdom placed a Hebrew baby in a fragile basket on a crocodile infested Egyptian river. Wisdom caused him to be rescued and raised in the presence of the very same enemy, Pharaoh, who had tried to kill him. Then Wisdom caused him to confront the enemy and free his people. This Hebrew was Moses. Wisdom sent the King of kings into the world as a baby, born without pomp or ceremony on the outskirts of town in a cave. Wisdom caused men to put Him to death on a cross so that He could give these same men eternal life. His name is Jesus. God is requiring that His true sons abandon what the world calls common sense and tap into the Wisdom that only He provides. It is a bold step of faith, because some of the things that He will require of us will make no sense to onlookers, and may even cause us to be ridiculed. “For you see your calling, brethren, that not many wise according to the flesh, not many mighty, not many noble, are called. But God has chosen the foolish things of the world to put to shame the wise, and God has chosen the weak things of the world to put to shame the things which are mighty; and the base things of the world and the things which are despised God has chosen, and the things which are not, to bring to nothing the things that are, that no flesh should glory in His presence.” – 1 Corinthians 1:26-29. Are you willing to make the sacrifice and be a “fool” for God? I have 1 Cor 1:25 written on a plate in my kitchen. It is a verse that really struck me when I read it. 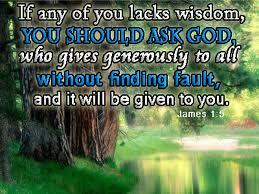 I am thankful for the Wisdom that the Lord imparts when we simply ask it of Him. 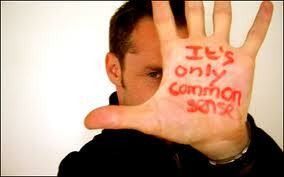 I think there is a great need for common sense in our world today, but you're right. God's ways don't always make "common sense". His ways are so much higher than ours. Thank you for this reminder. Love the Wisdom ways. I have a friend who reads from Proverbs every day besides her regular reading...trying to gain some wisdom from Solomon. I've adopted her quest for widsom, knowing God's Word is the best place to find it.